Is it just a coincidence that the more plugged in we become, the more we long to escape from those constant connections? If you’ve been reading these pages for any length of time, you probably know that we’re big fans of heading into the woods for our R & R. Over the summer, we had the opportunity to take our relaxation skills to the next level — by pretending we were kids again and living in a Vermont treehouse. Just one night was all it took to set things right. 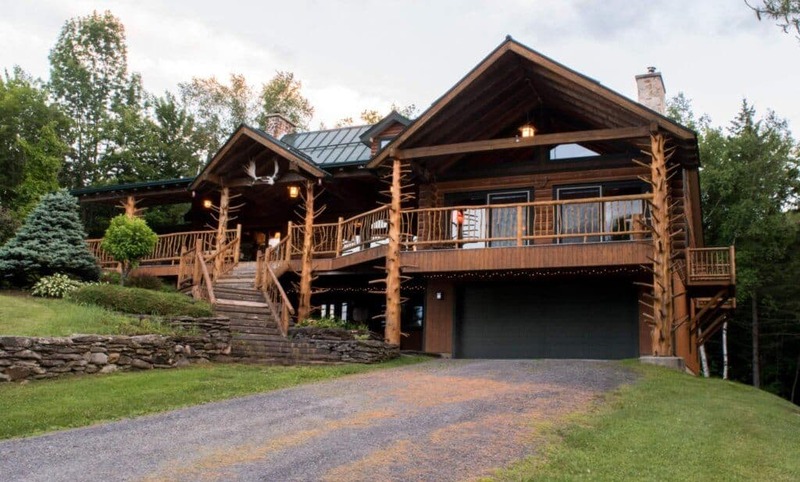 Moose Meadow Lodge and Treehouse is tucked away in the Green Mountains on 86 pristine acres near Waterbury, Vermont. The main lodge is gorgeous, and inviting, with four luxurious guest rooms, whimsical decor, incredible views, and a sweet jacuzzi tub. 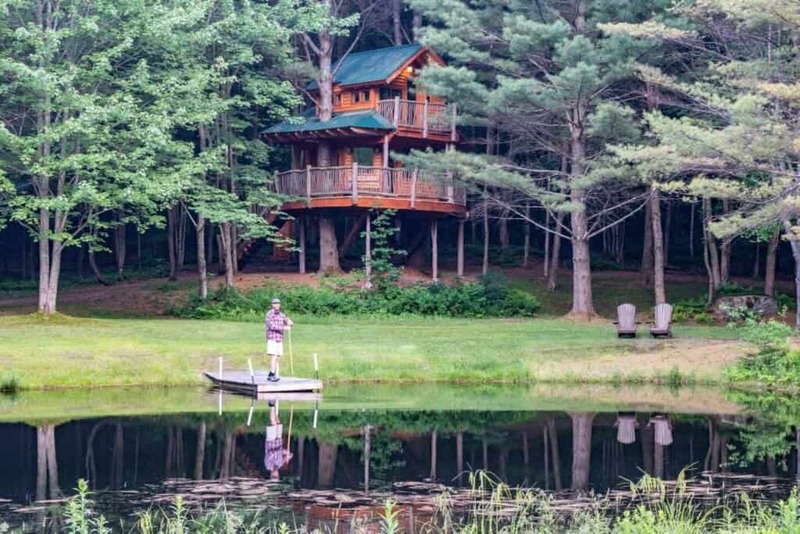 But the magical Vermont treehouse rental is what really caught our attention. We discovered Moose Meadow Treehouse on Hipcamp, and because I was a field scout at the time, I signed up to do a photo shoot and explore the property. I’ve stayed in some pretty cool places all over New England, but a Vermont treehouse experience was a first for me. Playing some music in front of the fire. My husband and I arrived on a Tuesday evening, just as the sun was setting behind the mountains. We parked near the main lodge and were immediately greeted by one of our hosts, Greg, and his nephew, who whisked our bags into a golf cart and beckoned us to follow. The treehouse is located in a secluded clearing behind the main lodge, overlooking a small trout pond. 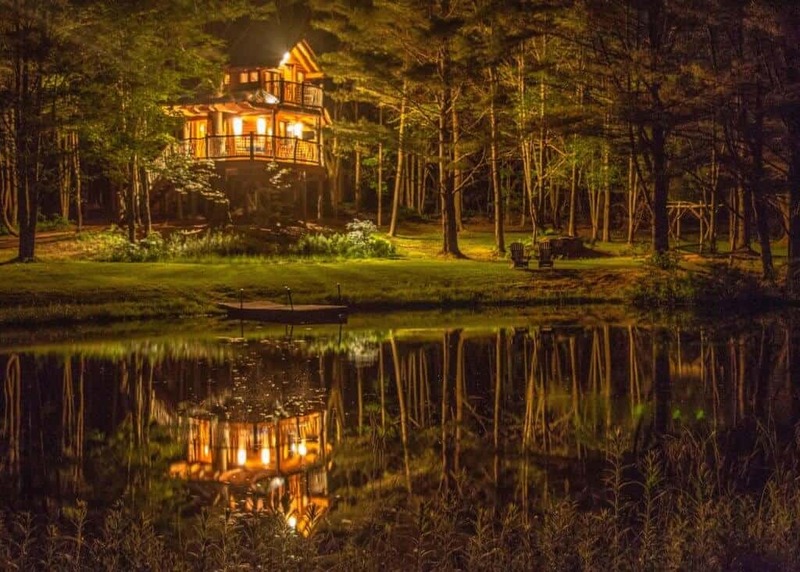 Even though it was near dusk, our first views of this hidden Vermont treehouse took our breath away. It was like strolling straight into Neverland! We spent the whole night and the next day reliving our childhood — wandering in the woods, swimming in the pond, and swinging from the trees. Adult moments included a trip into Waterbury for dinner and a glass of wine on the balcony before bed. 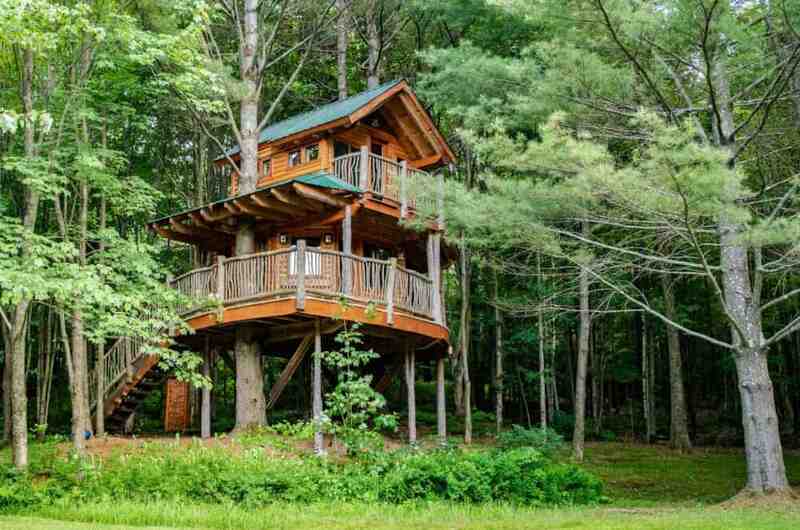 We’d love to take you on a little tour of this magical Vermont treehouse, and perhaps one day soon, you’ll find yourself sleeping high in the trees in Vermont’s Green Mountains. Moose Meadow Treehouse seamlessly blends the wild woods with the warm comforts of home. 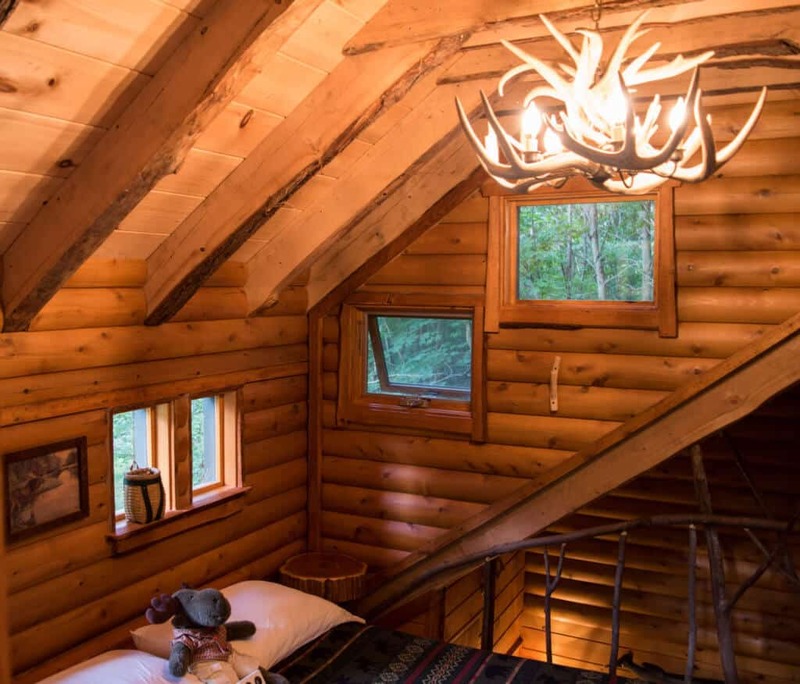 Rustic details abound, from the hand-carved stone sink in the bathroom to the deer-antler chandelier and stuffed critters keeping watch over the spiral staircase. With two stories and a single queen-size bed, this is a perfect retreat for a couple or a small family. The first floor is small and cozy — with a bench, a table, two chairs, and an electric wood-stove to keep out the chill. There’s a little nook with a coffee maker, mugs, wine glasses, and a few books and games. A small closet contains the garbage can and some basic cleaning supplies. A wrap-around balcony leads to the incredible outdoor shower — be sure to take one even if you’re squeaky clean already! There’s also an incinerating toilet, more benches for hanging out with the view, and a propane grill. The bedroom is on the second floor, with a queen-size bed (look for custom chocolates on your pillow), and another sweet balcony overlooking the pond. The bed is one of the coziest I’ve ever slept in — even more comfortable than my bed at home. If the property wasn’t so gorgeous, I may have been tempted to while away the day right there. The deer-antler chandelier in the bedroom. Moose Meadow Treehouse guests all have access to the main lodge, which boasts a full kitchen, a living room with cozy seating (a TV and Wi-Fi too), and a hot tub. There are plenty of cozy corners to relax inside, or you can hang out on the balcony, which offers up a pretty stunning view of Hunger Mountain in the distance. 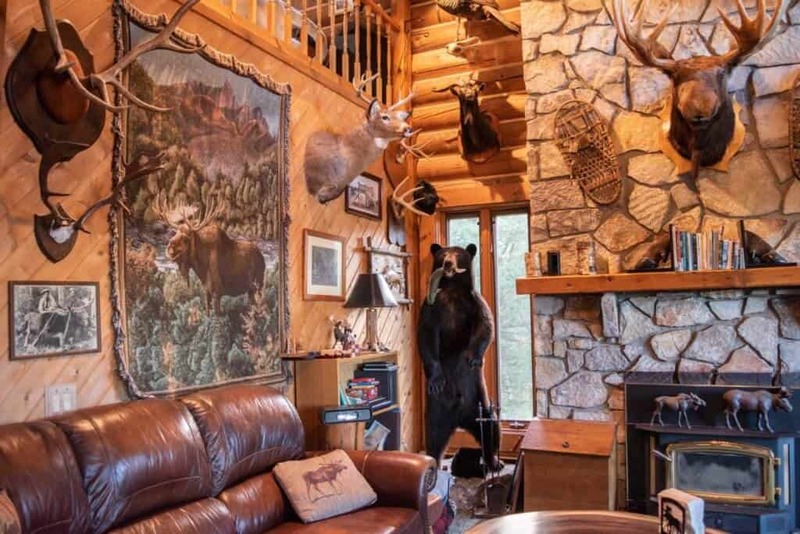 Lodge guests can choose from one of four themed bedrooms, all meticulously decorated with antiques and collectibles that fit the luxury hunting lodge theme. One room, my favorite and the one I don’t have photos of, is the sled room – beautiful antique wooden sleds cover the wall and the ceiling. Another room is decorated with fishing creels. It is obvious that a lot of love and meticulous attention to detail was put into every corner of this place. 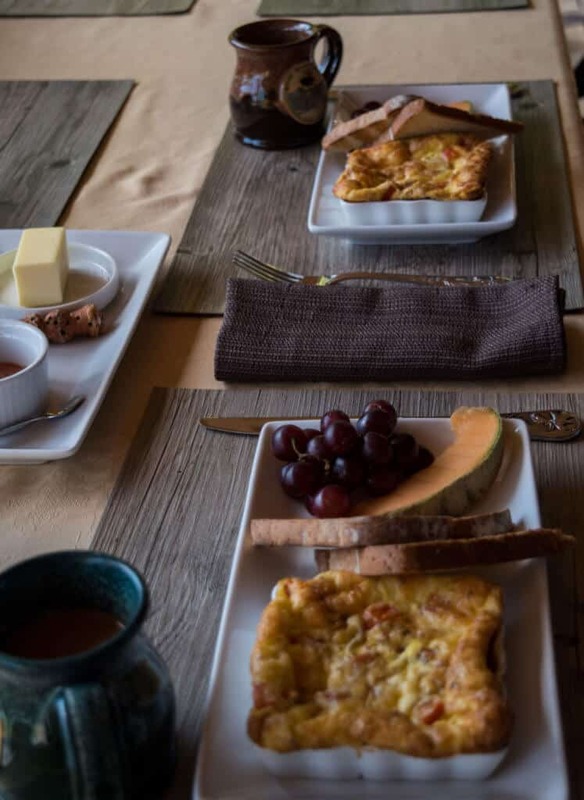 Breakfast is provided each morning, cooked up by Willie, who is a co-owner, host extraordinaire, and a fabulous chef. Willie is happy to accommodate any dietary restrictions you might have, so feel free to discuss this with your hosts before your arrival. During our stay, we were treated to omelets, fresh fruit, and coffee. Our meal was incredible and big enough to fuel our explorations of the rest of the property. 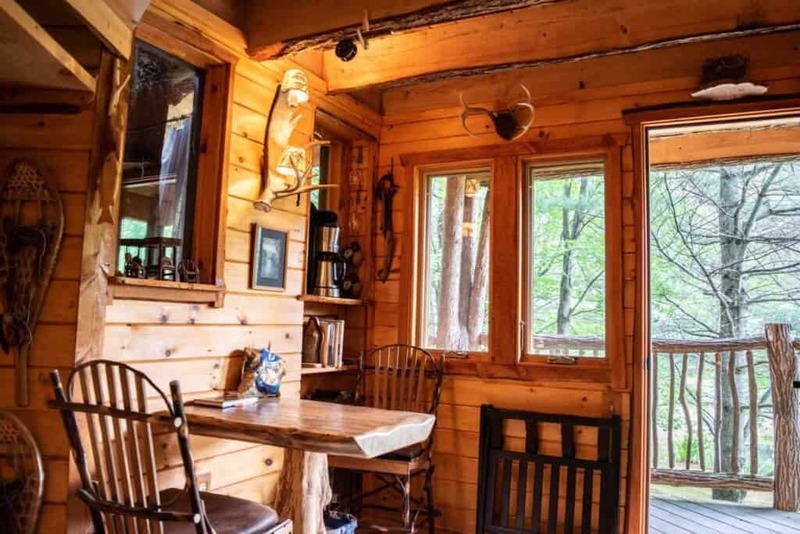 Trails crisscross much of the 86 acres surrounding Moose Meadow Lodge, and you won’t be surprised to see that the trails are as beautifully maintained as the lodge and treehouse. 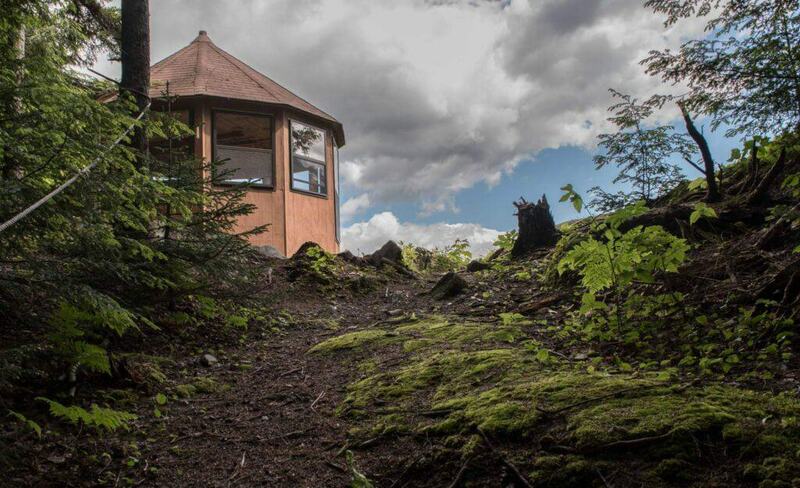 Ask Greg or Willie for a map before setting out, but be sure to check out the Sky Loft, which is perched on a rocky outcropping, with incredible views of Hunger Mountain and the Worcester Range. It’s a great place for a picnic lunch or just watching the world go by. During the winter months, you can borrow snowshoes at the lodge to help out with your meandering. If the heat of the day beckons you to cool off, we recommend indulging yourself by swimming in the pond. The water is perfectly cold and clear, and there’s a nice dock for sunning yourself after your swim. A fire pit with ample seating for a big group or cozy gathering, is located just up the trail from the treehouse, and while we didn’t have an opportunity to take advantage of it, we’re excited to go back for another visit someday soon. Waterbury is one of those quintessential New England villages that is fun to visit in every season. During our Vermont treehouse experience, we dined at The Reservoir, which I can’t say enough good things about. The atmosphere was cozy, but modern, the food was divine, and the beer selection was everything we’ve come to expect from Vermont. We also checked out Warren Falls for a little more swimming (it’s what we do), the Ben & Jerry’s Factory just because, and Cold Hollow Cider Mill, to pick up some hard cider to bring home. 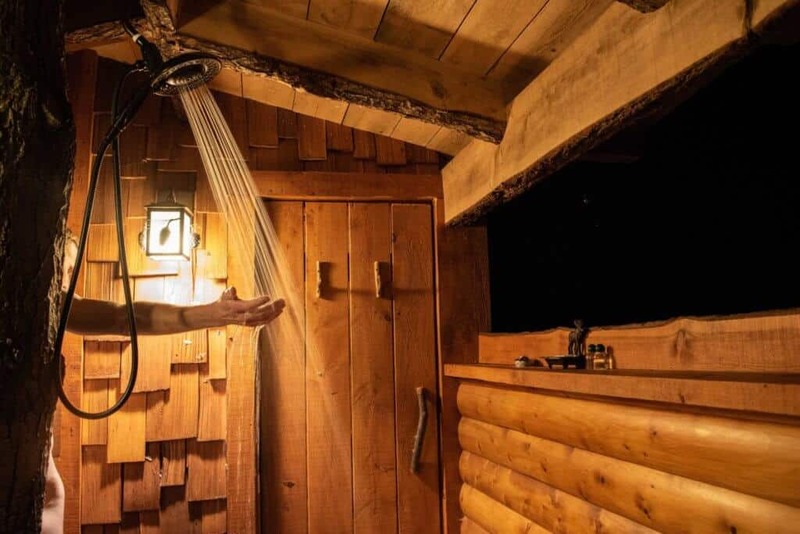 Moose Meadow Lodge and Treehouse is a magical experience, best enjoyed on a special occasion when you need to disconnect and treat yourself or someone you love. 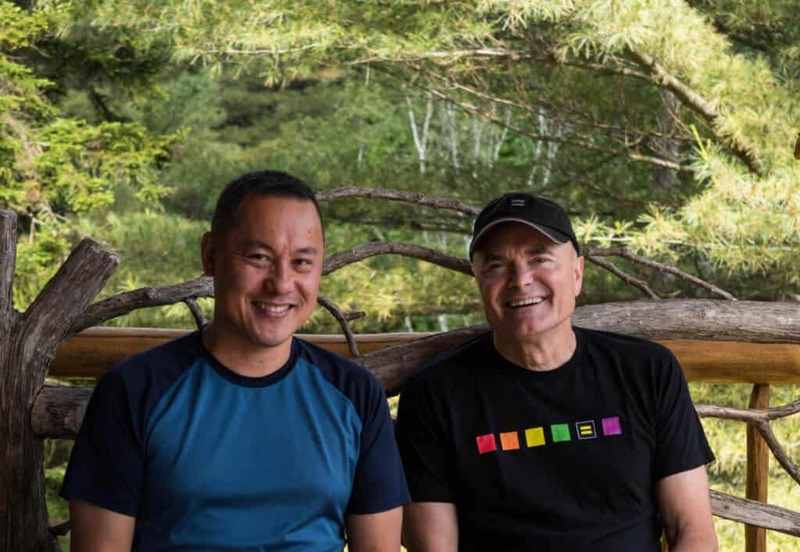 Willie and Greg could not have been more friendly and welcoming — it’s no wonder they were named Vermont’s B&B Innkeepers of the Year in 2005 by the Vermont Lodging & Restaurant Association. They have thought of everything, and I believe their goal is to truly delight their visitors to an experience they will never forget. It worked for us, and we are constantly scheming on how and when we can go back for another visit. Ready to relive your childhood in the most relaxing way possible? Moose Meadow Lodge is listed on numerous online booking sites, including Glamping Hub and Hipcamp. If you are new to Hipcamp, use our referral link to earn $10 off your first booking. You can also book directly on the Moose Meadow Lodge and Treehouse website. It’s so true, I love escaping from it all from time to time. My last escape was to a remote island in the Bahamas earlier this year but this also sounds like a place I would love to go to get away. The treehouse just looks adorable!! Oh my God this tree house looks amazing! I consider myself to be a camping expert but I haven’t been glamping really, even though I would love to! I imagine it to be a great experience having a place right in the middle of nowhere surrounded by nature and still have some comfort level 🙂 I’d stay in this tree house any day! This looks amazing! Staying in a treehouse is at the very top of my list of things to do locally here. Hopefully I find one as cool as this! It takes glamping to a whole new level, Liliane. I think you’ll love it. I love how guests have access to the main lodge too! Sometimes it is nice to relax and maybe meet others and watch a movie with friends or hang out with wifi heeehee! The interior is so cozy too! It’s definitely a great perk. We would have loved to spend more time there, but we loved the cozy treehouse best. This looks amazing! I’ve been wanting to stay in a treehouse for a while now and this looks like it would be perfect for our little family! New England has also been on our list for awhile, so I’ll just have to try to make it happen! Wow that place is awesome! And with such a great breakfast included to start the day. I can’t think of a better way to take in the Vermont wilderness! I can just imagine being there, so peaceful & right there in the trees. This looks like an amazing place. Thanks also for the intro of Hipcamp, which seems perfect for some cool glamping! Oh wow! That treehouse looks like the cosiest hideaway. What a great place to stay, and I love that all the things you can do, like hiking and swimming in the lake, are so in keeping. And I really fancy having a go in the open air shower! How cool is that? This is so amazing! 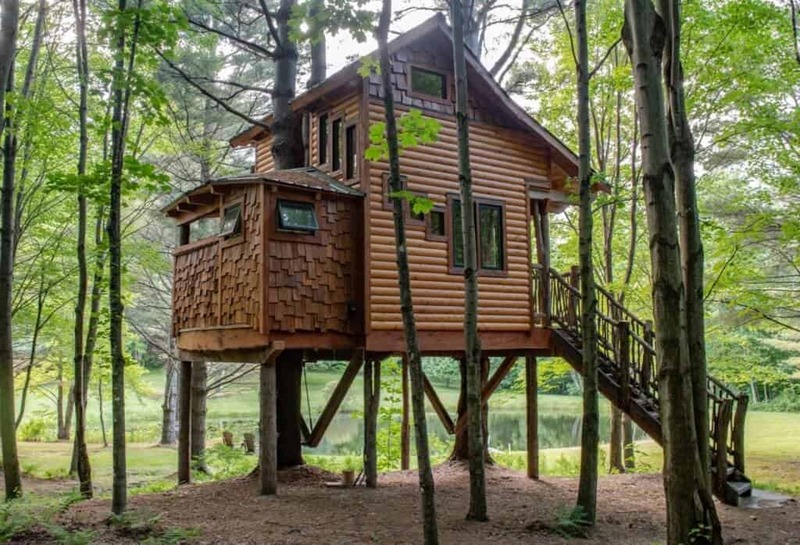 I’ve always wanted to stay in a tree house and this one looks super awesome. I mean just look at the interiors, so cosy. And a swim in that lake, incredible! 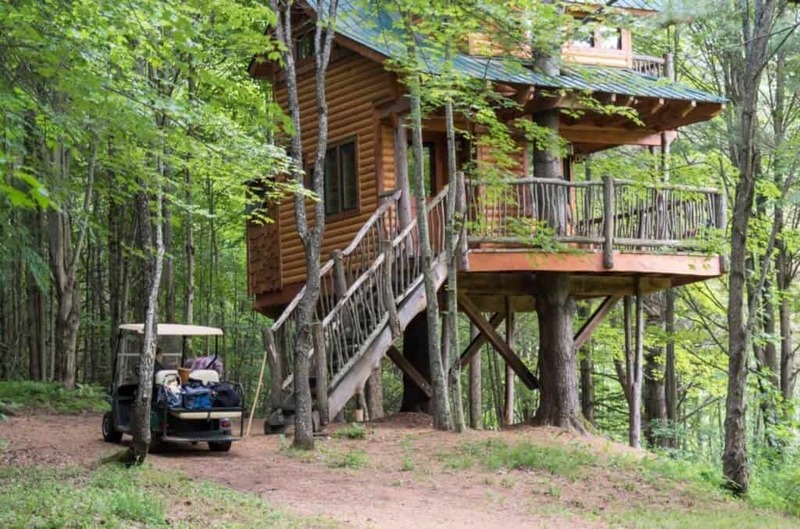 I keep checking out all posts about treehouse stays because it sounds like so much fun! It’s the kind of thing my husband and I would love… Exploring the woods, going for a dip in a pond, and enjoying a rustic treehouse! I’d love to find one a little closer to southern CA. Tami – You should check out Hipcamp. Lots of incredible properties in CA.